California except under permit issued by the California Department of Fish and Wildlife. sightings related to non-native watersnake species (Nerodia) in California. California Watersnakes Site, please report it to California Nerodia Watch at iNaturalist. A large adult Northern Watersnake in Placer County crawls into the water. 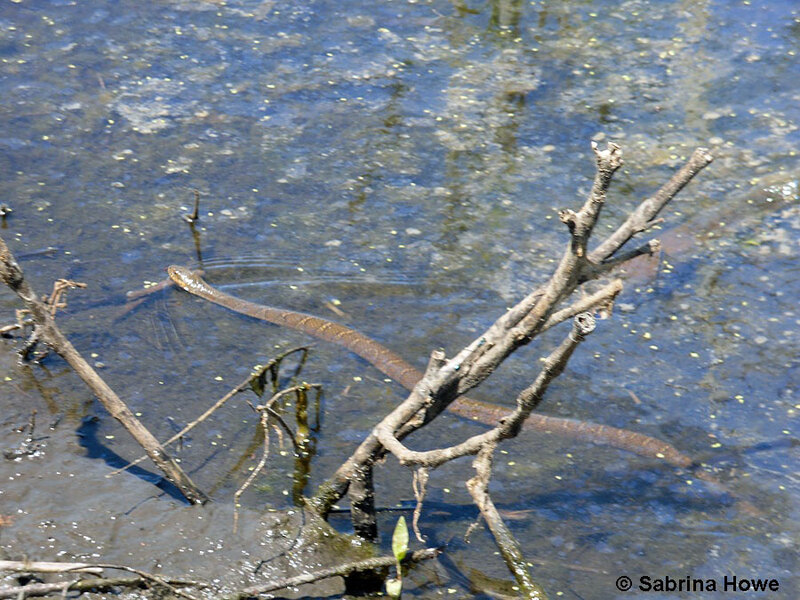 A large adult Northern Watersnake in Placer County in the water. Not Dangerous (Non-poisonous) - This snake does not have venom that is dangerous to most humans. From 12 - 42 inches (30 - 107 cm) up to 55 inches in length (140 cm). Dorsal and ventral patterns are variable. Color can be brown, gray, brownish-black, or reddish, darkening with age. Older adults are often all dark in color without any markings. The head is typically one color and is gradually more rounded and more flat on top than the head of Nerodia fasciata. The body is usually marked with dark blotches and dark crossbands ring the neck. The underside is white, yellow, or gray with crescent or half-moon-shaped markings that are dark and sometimes tan or yellowish in the center. Spots may be in a double row or in a striped pattern. Little is known of the natural history of this snake in California. In its natural habitat, they are active both day and night, and are usually seen in the morning or late afternoon when they are basking in sunny areas on stumps, rocks, logs, or vegetation next to water. Activity takes place from April to October in the northern part of its range, and earlier in the spring and later in the fall in the southern range. They hibernate during winter in burrows, crevices, or rock piles near or close to water, sometimes in den shared with other snake species. This snake will bite and release excrement and musk when threatened or picked up. The saliva contains an anticoagulant which creates profuse bleeding in the victims of its bite. Diet consists of small aqatic vertebrates such as fish, frogs, salamanders, small mammals, and even small birds, and invertebrates such as various kinds of worms, leeches, and crayfish. Snakes typically hunt for food along the edge of shallow water. In the natural range of this snake, mating occurs from April to June. Females typically give birth to 15 - 30 live young between August and October in the northern part of its range and in July or August in the southern part of its range. Breeding may not occur every year. This snake lives just about anywhere near fresh water - rivers, creeks, canals, lakes, ponds, oxbows, reservoirs, bogs swamps and marshes. It also inhabits brackish and saltwater habitats in some locations. 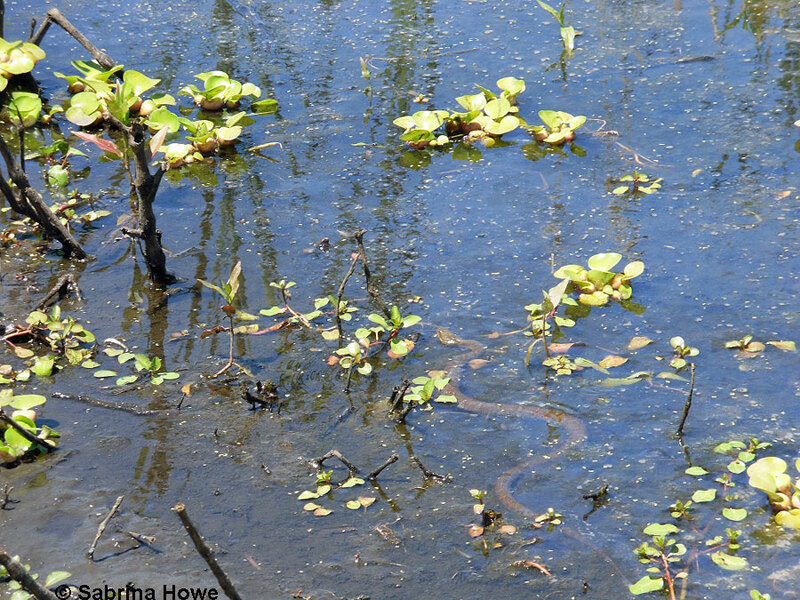 In Placer County, they have been found along the edge of a large freshwater marsh. This species is found throughout most of the United States east of the Mississippi River excluding parts of Maine, most of Florida and parts of the southeast coast, and west of the Mississippi through the central part of the country as far west as Colorado. It also occurs in southern Quebec and Ontario. In California they have been established in Roseville, Placer County (Balfour et al. 2007. Herpetol. Rev. 38:489). It is not known which subspecies has become established in California, but it is most likely N. s. sipedon. Spread of this snake downstream into the Sacramento Valley could possibly threaten populations of the already endangered Giant Gartersnake, Thamnophis gigas. It could also pose a threat to other native fish and wildlife. As of Janurary 2008 it is unlawful to import, transport, or possess any Watersnakes of the genus Nerodia in California except under permit issued by the California Department of Fish and Wildlife. California Nerodia - a website about introduced populations of Nerodia found in California. * Gibbons, J. Whitfield, Michael E. Dorcas. North American Watersnakes - A Natural History. University of Oklahoma Press. 2004. Robert Powell, Roger Conant, and Joseph T. Collins. Peterson Field Guide to Reptiles and Amphibians of Eastern and Central North America. Fourth Edition. Houghton Mifflin Harcourt, 2016. Conant, Roger, and Joseph T. Collins. A Field Guide to Reptiles and Amphibians Eastern and Central North America. Third Edition, Houghton Mifflin Company, 1998. Bartlett, R.D., & Alan Tennant. Snakes of North America - Eastern and Central Regions. Gulf Publishing Co., 2000. It is against the law to capture, move, possess, collect, or distribute this invasive species.